Back in September 2013, I posting this explanation on one of the key potential problems with fracking. At that time, I did not have access to data regarding the failure of well bores in areas where there has been substantial horizontal drilling and multi-stage fracking on land. Thanks to researchers at Cornell, we now have some idea about where the potential problems with shale gas may lie. First, let's review. 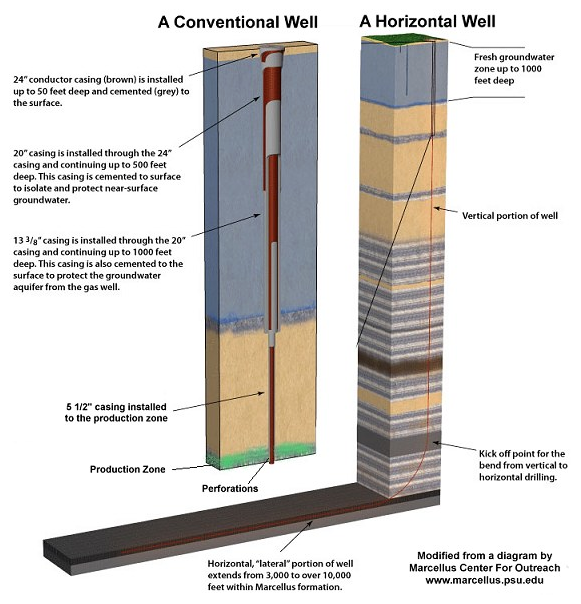 Here, quoting from my posting in September, is an explanation of how a well is drilled, completed and where the problems with well bore integrity can crop up. When the oil industry drills a borehole to depth, as you can imagine, the sides of the borehole are very unstable and rock continually sloughs into the hole, causing all manner of problems. To alleviate these problems, a long string of hollow steel production casing of varying diameters is run into the hole to the total depth of the well (or somewhere below or at the depth of the producing formation depending on the type of well). The diameter of this casing is somewhat smaller than the diameter of the borehole; the space between the walls of the borehole and the outside of the production casing is known as the annulus. Once the casing is in place, cement is pumped down the casing and flows back up the well between the casing and the sides of the borehole through the annulus. The cement is allowed to harden and tools are run to ensure that the "cement job" is sound. The purpose of the cement is three-fold; it holds the casing in place, it prevents the fluids used in the well completion operations from flowing to the surface and it prevents fluids from inside the borehole from flowing into the surrounding formations once the well is completed and on production. For example, if there is a water-bearing formation above the productive zone, the production casing and cement will seal off that formation, preventing the formation water from flowing into the well bore. One of the key issues that can cause a completed well bore to fail is related to the cement that is used to fix the production casing in place. In some cases, the when the cement is pumped down the well bore, it fails to displace the drilling mud in the annulus and in some cases, the cement fails after a period of time. This failure allows the formation fluids including oil, natural gas or water of varying salinity that are under higher pressure because of the weight of the rock that lies on top of them to flow through the annulus to the surface where the pressure is lower. It is this problem of well bore integrity that results in contamination of near surface groundwater and the atmosphere. 1.) Shale gas wells require much higher volume fracks than conventional gas wells. 2.) 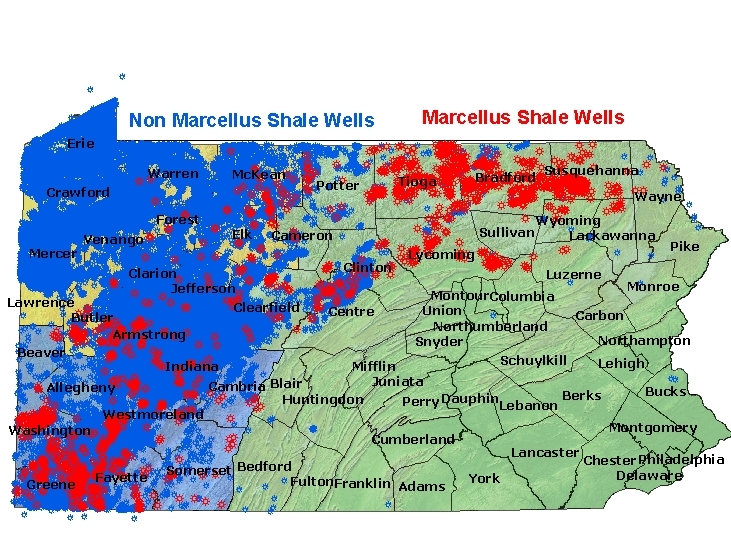 Shale gas wells require far higher well density than conventional gas wells. These two factors help explain the potential magnitude of the problem with shale gas production. 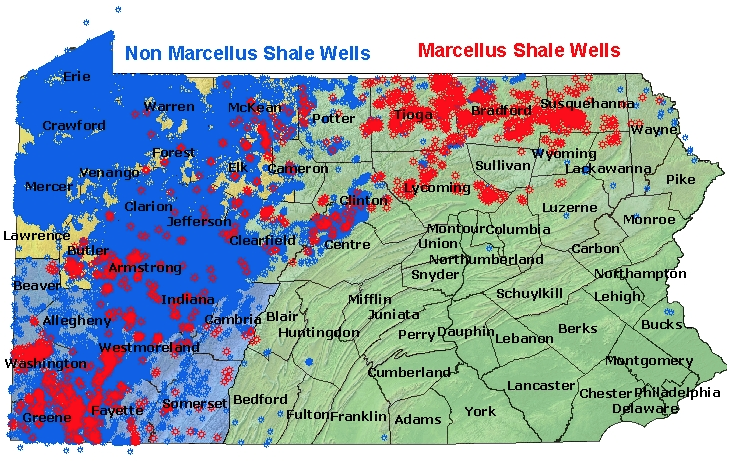 Please note the concentration of Marcellus producing wells in the northeast part of Pennsylvania. Now that you have all of that background information, let's look at the study by the Cornell-led research team. The researchers, Anthony Ingraffea, Martin Wells, Renee Santoro and Seth Shonkoff, examined compliance reports for 41,381 conventional and unconventional (i.e. 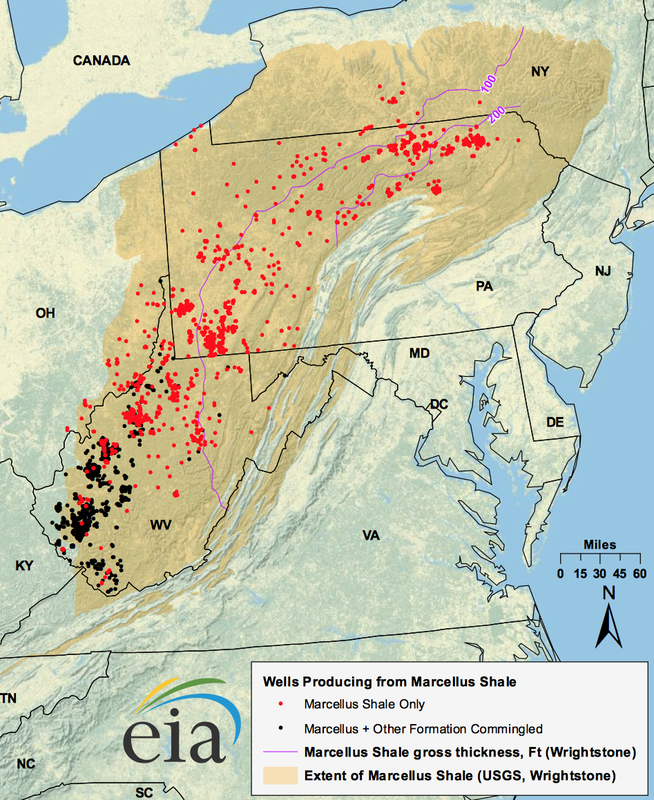 shale gas) wells in Pennsylvania that were drilled between January 1, 2000 and December 31, 2012. In total, 32,678 wells were inspected; of these, 26,915 were conventional wells and 5,763 were unconventional. The majority (92.6 percent) of the unconventional wells were drilled during or after 2009. The objective of their examination was to get complete and accurate statistics of casing and cement impairment, otherwise known as well bore integrity. Previous studies noted the presence of thermogenic methane which is sourced in deeply buried sediment (i.e as opposed to biogenic methane which is a result of near-surface bacterial activity) in private water wells in Pennsylvania and this study looked to identify the sources of this contaminant. 1.) Failed cement barriers because of inappropriate cement density, inadequately cleaned boreholes, premature gelation of cement, excessive fluid loss in the cement, cement shrinking, high permeability in the cement and normal age-related deterioration. 2.) Failed casing because of collapse and corrosion. In these cases, fluids can flow from the reservoir at depth to the surface or into aquifers. In cases where there are leaks that cannot be repaired, Pennsylvania regulations mandate that these wells be permanently plugged and abandoned. Unfortunately, in many cases, the flow of hydrocarbons and formation waters between zones may still occur, resulting in continued contamination of aquifers and the atmosphere. Conventional wells spudded before 2009 had a structural failure rate of between 0.73 percent and 2.08 percent after 2009 in non-northeastern counties of Pennsylvania. Unconventional wells over the same time periods had a failure rate of 1.49 percent and 1.88 percent. The differences begin to show up in the Northeast counties of Pennsylvania; in pre-2009 conventional wells, there was a 5.29 percent failure rate and a 2.27 percent failure rate after 2009. Unconventional wells in the same area had far higher failure rates; unconventional wells spudded before 2009 had a failure rate of 9.84 percent and nonconventional wells spudded after 2009 (over 92 percent of the unconventional wells as noted above) had a failure rate of 9.14 percent. Wells spudded before 2009 make up 72 percent of the total wells in the study but only 31 percent of the wells with casing/cement integrity problems. Of the wells drilled in Northeast Pennsylvania after 2009, unconventional wells are four times more likely to have integrity problems than their conventional counterparts. The northeast counties (which includes Bradford, Cameron, Clinton, Lycoming, Potter, Sullivan, Susquehana, Tioga, Wayne and Wyoming) make up only 11 percent of the 3030 wells spudded over the time frame of the study but make up 54.7 percent of the state's unconventional wells and 88.8 percent of the wells with cement and casing integrity issues. The authors conclude that there is a 1.6- to 2.7-fold increase in the risk of well integrity problems in unconventional wells versus conventional well types. The study predicts that in the Northeast counties of Pennsylvania, the cumulative hazard of well casing or cement failure will exceed 40 percent over the next 25 years. Keeping in mind that cement and casing integrity usually declines as a well ages, their estimates may not be far from wrong. Given that over a 100 year period, methane is 21 times as potent as a greenhouse gas when compared to carbon dioxide, the impact of well integrity issues in unconventional wells across the United States and around the world could be very significant in the coming years.